I've spent most of my adult life in the no-murals-ever camp. I didn't want anything too themed because I knew I'd get tired of it and want to change it, so what's the point? 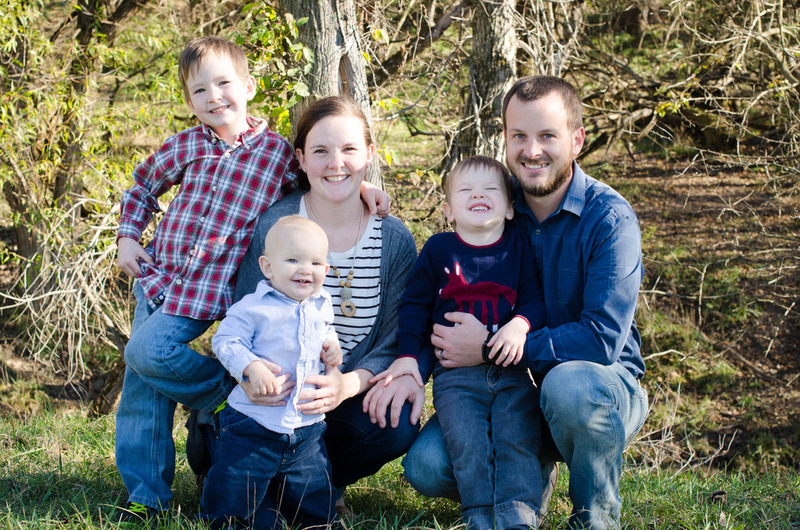 But then... we started collecting all these little boys and one day I was like "THEY WOULD LOVE A CAMPING ROOM." 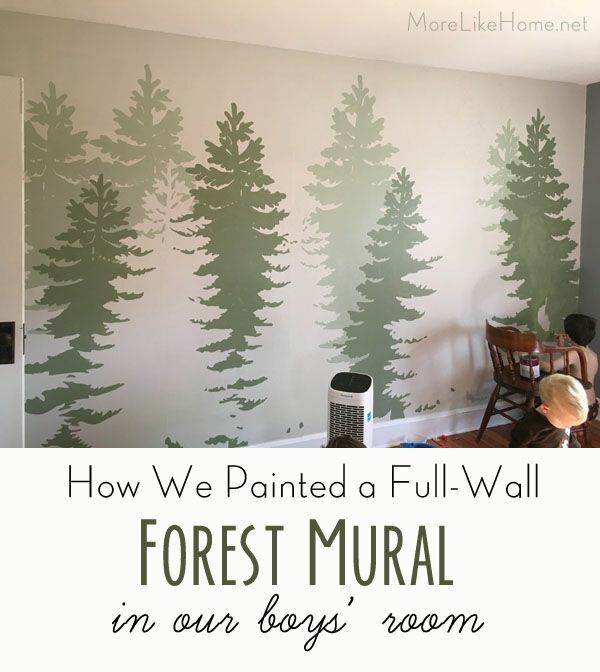 Then it took me all of five minutes longer to come up with a forest wall mural and throw my mural-morals to the wind. And I totally l.o.v.e. it. If you follow me on instagram, you've probably seen a few peeks of the surprise we put in the boys room for Christmas. 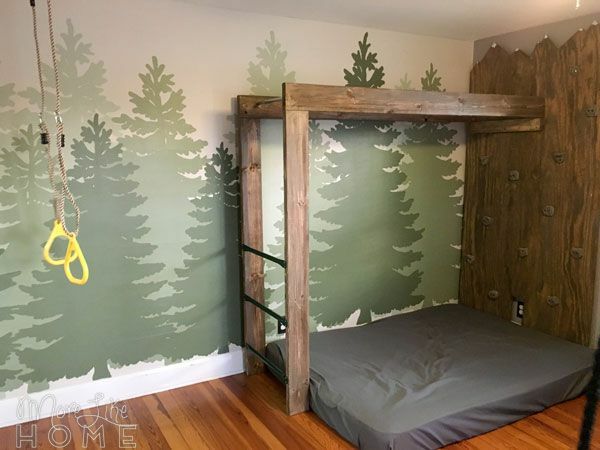 Their camping theme room (or maybe more of a wilderness theme, there aren't actually any tents) is complete with a mountain peak climbing wall, monkey bars, and swings. A real winter adventure zone for all these little fellas! 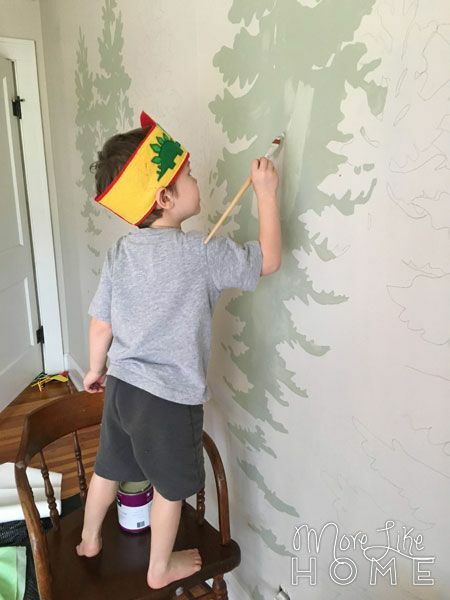 We'll be sharing the plans for all that soon, but today we're staring with how we painted the mural wall (which is easier than you might think). 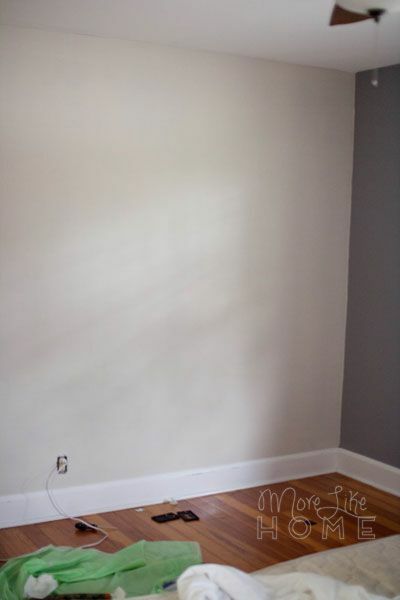 Our first step was painting that wall. 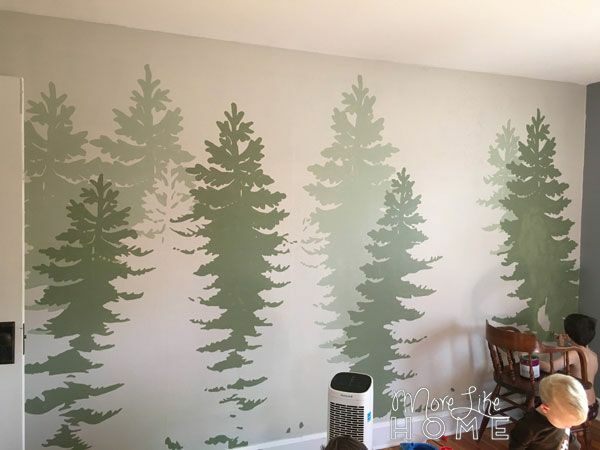 Their room is the same blue-ish gray that it was when we bought the house (we've barely touched the upstairs at all), and I knew it needed to be lighter for our forest wall to pop. You can see the original color to the left of the door. 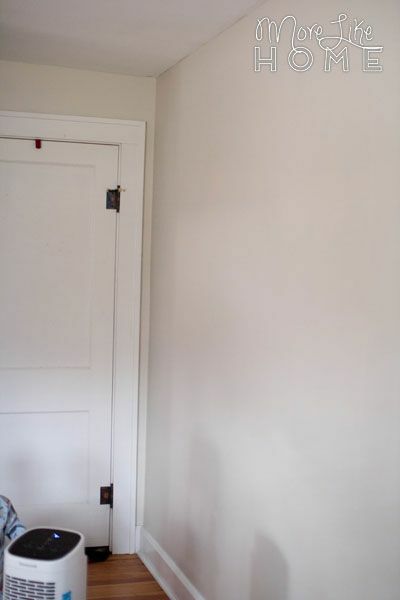 So I painted it this fancy custom shade of light gray that I like to call "Georgia's Gray." I made it myself with science and precision. I took a gallon of Fossil Gray paint left over from our living room and poured some into a half gallon of leftover white. And stirred them together to make a lighter gray. BOOM. Free paint. I mean fancy paint. 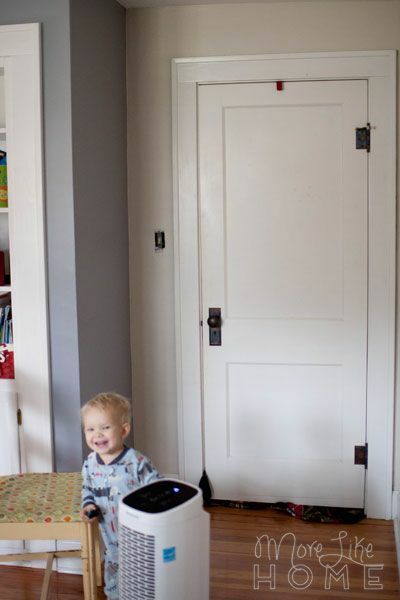 We only painted this one wall for now (plus around the doorway because it was too hard not to paint that little space next to the door) but there's a slight debate in the household about whether we should paint the rest of walls. I will admit, now that it's done, the blue-gray is growing on me. But I'm withholding judgment until we get the rest of the room together. 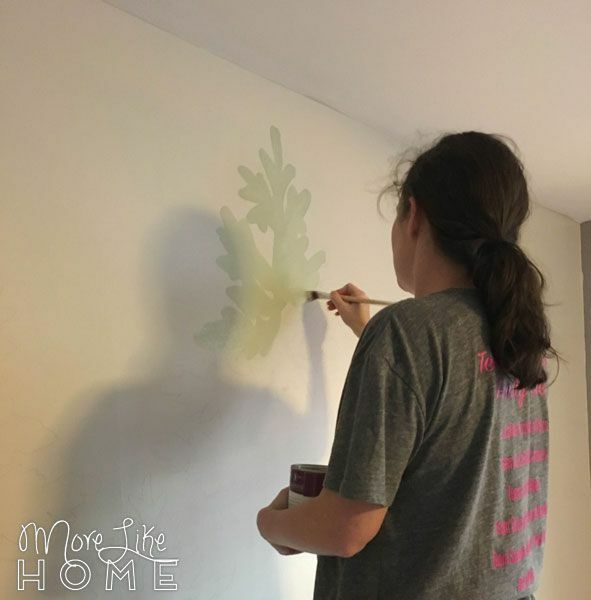 A realistic tree shape in a simple color blocking style, growing right up from the floor. Check, check, check! 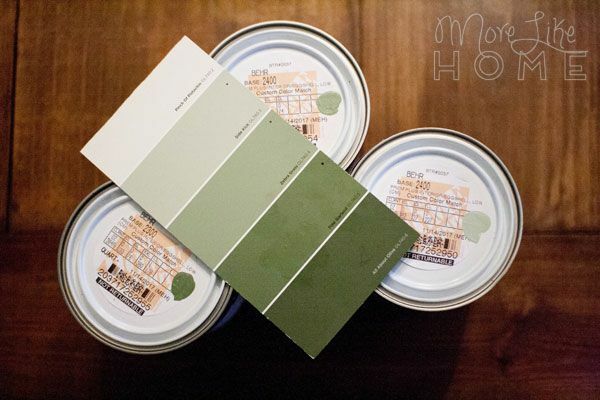 I bought a quart of each in an eggshell finish in Behr's zero VOC paint (no fumes in the boys' room, please!). 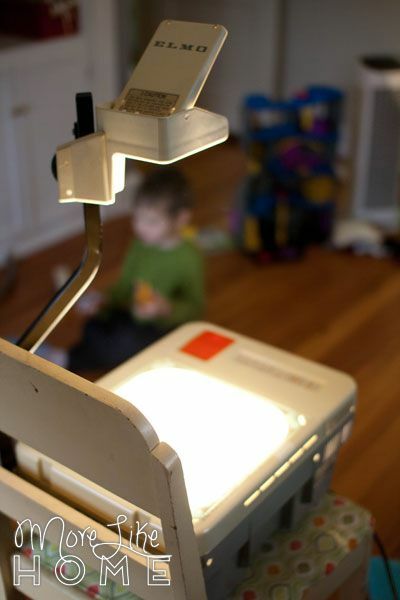 Now here's the only tricky part of this project: you need an overhead projector. I was able to borrow one from my mom (she got it at a rummage sale for $2! ), but you may be able to rent one from your library or office supply store. 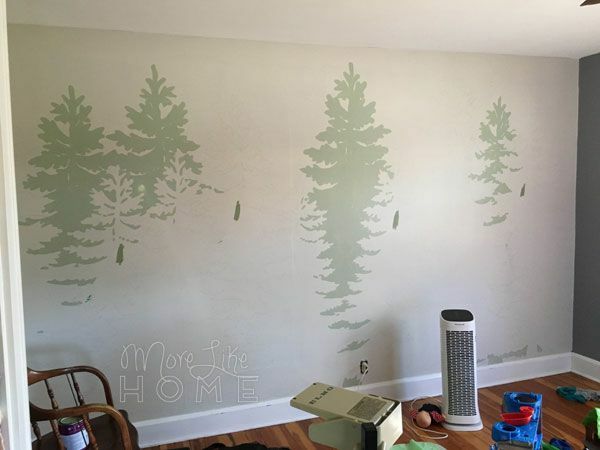 I made an outline picture of the trees that we could use to trace the design on the wall and printed them on transparency film. You can click the image below to print your own, but you'll have to play around with the print scale to get the right size for your space. I had to zoom in and split the image across three transparencies in order for them to project tall enough. FYI, you have to print transparencies with a laser printer (not inkjet) or have it printed at an office store. 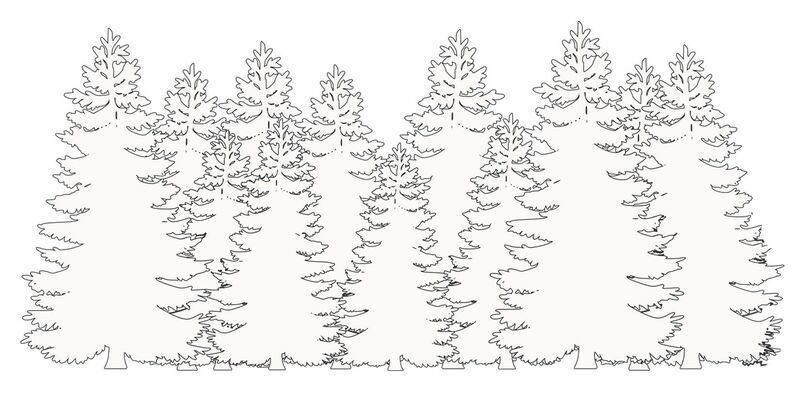 each time you switch transparencies, line it up the best you can but don't sweat if it's not perfect. 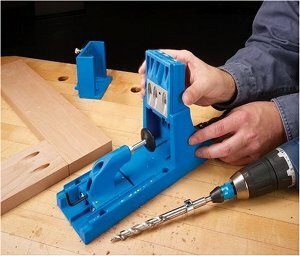 Just connect the lines as you draw. bring the pencil sharpener. You're about to go through a whole lot of lead. Our biggest boy loved helping with this part. 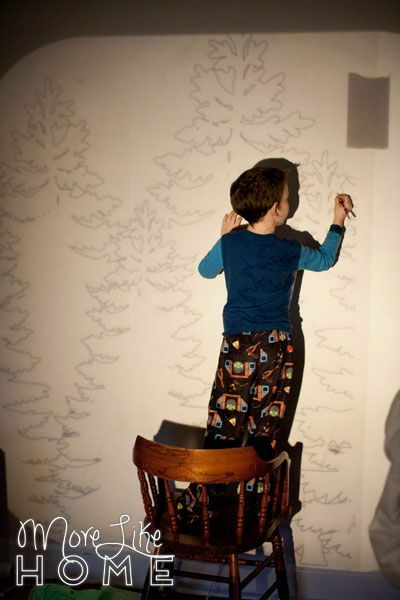 The smaller boys loved making shadows and bumping the $200 piece of borrowed equipment. After that we called it a day. This took a while and I'll tell you know, my arm muscles obviously are not what they should be. But the next day, we were ready to start painting. 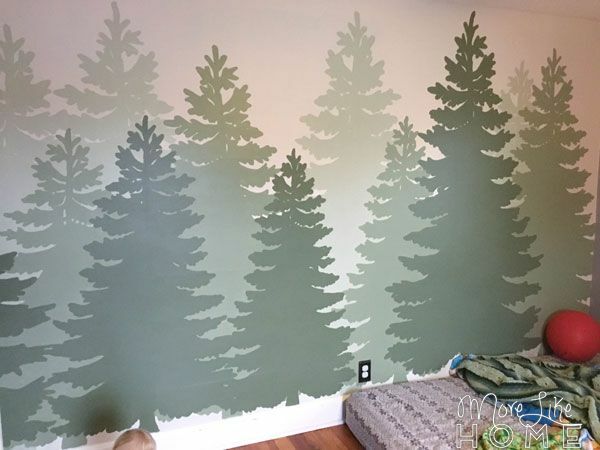 I found it easiest to start with the back row of trees (it's easier to paint over any messy edges later than to fill in between the front trees without messing them up) so we opened our lightest green first. But the boys insisted I leave the centers for them to paint. And they did not let me forget it. So I painted in the edges pretty far and left openings in the very center that weren't close to the edges. Like at all. And I gave them the small paintbrush to fill it in with. Wonder of wonders, we wiped a few drips on the floor but they didn't get a single stroke outside the lines. And they felt like superstars. ...and they filled in the middles. And finally we did the front row with the darkest green. For this row, I started with the edges again, then filled them in most of the way with a larger brush before I let the boys loose. We had a lot more tree to cover here. I used over half the quart of the dark green! I had to do a touch-up second coat, especially on the darker colors, but it went quite a bit faster since the edges were good. Then we let it dry and air out a few days just to be safe (the boys slept in our guest room that week) and it was done! 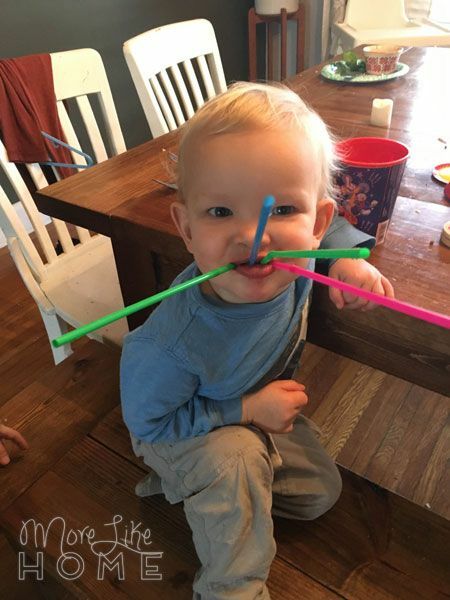 A very thirsty baby walrus. This mural ended up taking a few days to finish, but it was a pretty simple process and a fun project for the kids. 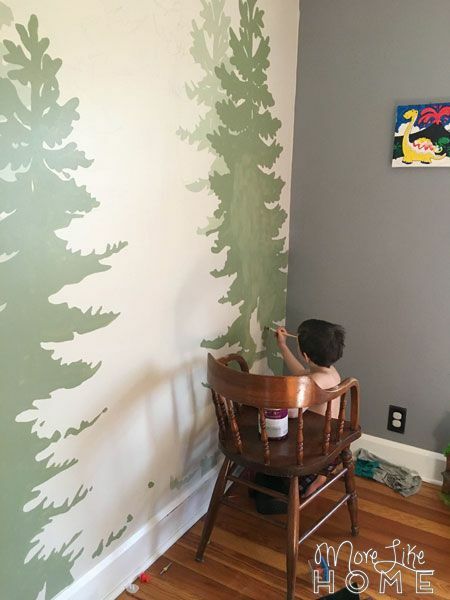 We'd love to hear if you paint your own! So what are you thoughts on murals? I'll tell you what, my eyes have been opened and I am fully on board! Would you be willing to tell me how you blew up the transparency to fit the wall? I'd love to see more but most of the pics don't show. I love it. 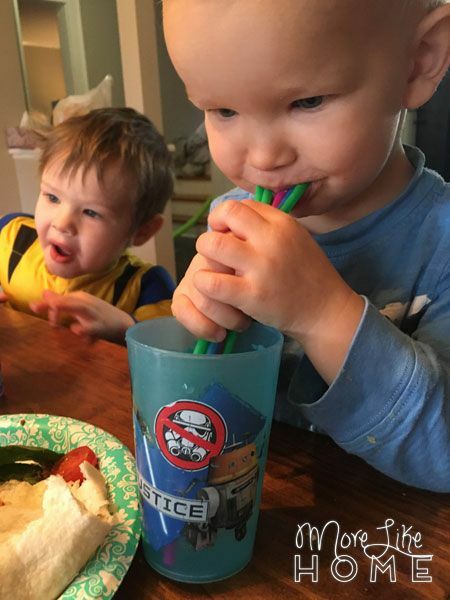 We are trying to do something similar for our sons 4th birthday. 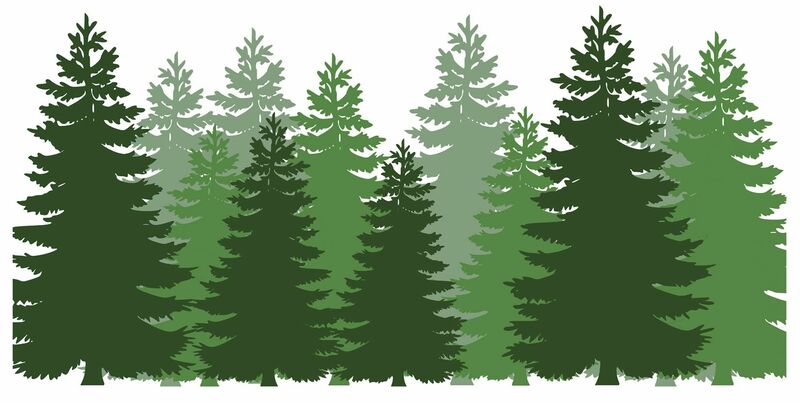 I can't find a decent forest image and wondered if you would be willing to share your one? I don't have photoshop to make my own.